Part 23: It gets better & better & . . . .
We've been docked here at Suzanna's for 10 days and have enjoyed every minute. New friends, good food, excellent weather and only a few bugs at sundown. The first few days we just chilled out a bit. I worked on the novel some, but otherwise did nothing really. . . . The Heide's employed four Guatemalan workers to clean up the outside of their boat, top to bottom, and also to refinish some bright work. They did a great job. Francesca will get a similar cleanup sometime before we leave. A few days ago, on Thursday, Joan and Marge made reservations for us to go to Tikal on a luxury bus. Mark and Mariam from the trimaran “Delphys” would also join us on this trip. It was a three-hour drive to Lake Peten and the island town of Flores where we were to stay the first night. (Not many years ago the roads were so bad that the same trip would have taken 12 to 14 hours if you made it at all). On the way the newly paved roads were excellent. However, the driver had to come to a near stop fairly regularly to avoid cattle, pigs, wagons, broken down vehicles, people and blind curves with approaching traffic on the wrong side of the road. Some very special animal crossing signs for tapir, tampisquintle, havolina, deer, coatimundi and cattle dotted the roadside. The bus was very comfortable with air conditioning, an attendant and two drivers. Box lunches and soft drinks were served. We weren't too concerned about bandits because our travel was to be mostly during daytime. Still, in the last month or so there had been a couple of bad incidents. No tourists were hurt, but we heard that a driver and assistant were shot to death. Joan had talked to a cruiser that had been on such a bus a few weeks ago and, as one would expect, he was really bummed out by the experience. I don't think that either case involved the big luxury busses though. Thankfully, we had no such problem. With all the activity on the road, it was hard to imagine how it could happen in the daytime. The countryside between the Rio and Flores was steeply hilly, lush green, and populated with a hut or two every couple of hundred yards. We passed through several significant towns including Poptun where there was a lot of activity. Very different from our previous travels in this country, there were only a couple of checkpoints, no military boardings (as had been usual a few years ago), and only an occasional assault rifle in view. We were told that the peace accord, signed three years ago, had included provisions for army and arms reductions. These were apparently being carried out. With new roads, more electricity and a much less threatening military, I think Guatemala has a new lease on life. There are still lots of problems, of course, but it's a good start. Thursday night in Flores was really pleasant. Joan, Mariam, Mark and I somehow missed Marge and Marv in our comings and goings. We would up at the Toucan Restaurant and bar. Naturally we carried Maggie along in her baby pouch, kind of a backpack you wear on the front side. Traveling in Latin America with a dog is a joy. Dogs, if they behave, are welcome in any bar, restaurant, pharmacy, hotel, store or whatever. Maggie's exceptional good behavior and odd appearance always charmed everyone. She is with us everywhere and sits beside us in a chair at the restaurants and palapa bars. Flores was the site of a decisive battle between the Mayans and Spaniards sometime in the 1600s I think. There was a Mayan temple on the island, but the Spanish tore it down and used the materials to build a catholic church. At the Toucan Restaurant overlooking Lake Peten, there was a Toucan named Tony that would come to your table and allow you to pet him. After we had all enjoyed more than our share of Gallo (pronounced Guyo) Guatemalan beer and there were bottles all over the table, Tony came for a visit. Maggie was fascinated by the bird. With no mal-intent, she put her paws on the edge of the table and brought her nose up to within less than a foot of Tony's long beak. The bird watched for a while, then made a quick move away that scared the . . . out of the Magster. She pushed away from the table with her paws with such force that the whole table moved. Beer bottles went everywhere and it looked like someone had just bowled a strike. We all had a good laugh and Tony took it in stride. At five AM the next morning, we met the bus for a one-hour ride up to the ruins at Tikal. Again, the hour suggested the possibility of bad guys, but the driver seemed in high spirits. Don't worry-, be happy. On arrival Tikal was shrouded in a heavy morning fog. The parrots were just becoming active and flocking up. Peacocks were everywhere and a couple of coatimundis were foraging for tourist junk food. Through the fog you could make out the top of Temple I as it peaked above the jungle canopy. 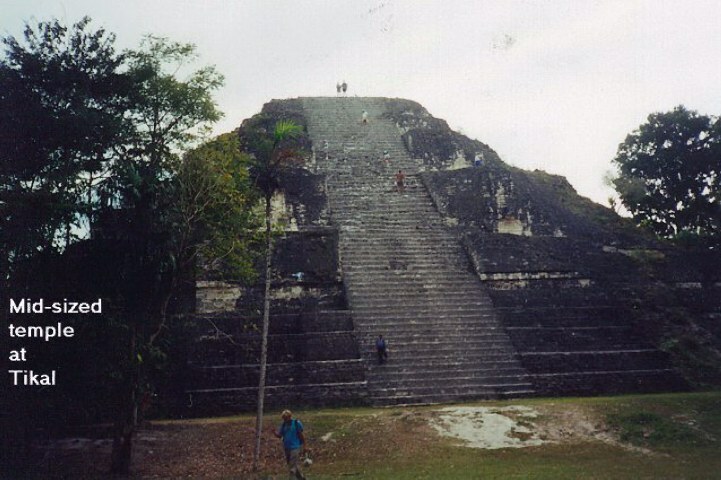 What a really magic place-, Tikal. The ancient city covers 64 square miles. There are perhaps a hundred major structures and virtually thousands of lesser, mostly unexcavated constructions. All of the ruins were built from quarried limestone. Don't quote me `cause I don't have the book right now, but as I recall the city dates from about 600 to 1200 AD. It is no longer permitted to climb Temple I, the limestone steps are too worn away. The steps go up about 150 feet and they are very, very steep. A fall would not be survivable. Temple Two, the monster Temple Four, Temples Five and Six are still climbable and with burning leg muscles we did so once again. The temples are all around 200 plus feet tall with at least two of them 250 feet tall. Maggie went up a couple of them, carried of course. From atop the temples you could hear the roar of the howlers echoing through the jungle canopy. Nearby, yellow birds, parrots, parakeets and coatis entertained us. Maggie seemed pretty impressed with the whole thing. We were at the ruins from 6:00 AM until 2:00 PM and were completely done in. It was a long walk and a lot of climbing, but fortunately it didn't get hot until early afternoon. Marge and Marv made all the rounds and did really well. But, no one escaped without a few blisters. On previous visits to Tikal we took many, many photos. So, without thinking, we did not take many on this visit and have little to show for this newsletter. The one temple photo shown pales when compared with some of the other structures like Temples I, II, III or IV or even the acropolis. The bus ride back to Flores was again uneventful. Our ladies had the rest of the afternoon to shop for goodies while we gentlemen found it better to take special medication for the pain at Tony's. On Saturday morning we had until 10:00 AM to finish the T-shirt shopping and get to the bus for the trip back to the Rio. Fabrics, clothing, hats and such were very inexpensive. A floppy, wonderfully decorated, good quality wool hat was 8 bucks. On the ride back we had a local paper that described some military activity dealing with terrorists at Poptun. It was mostly just political hype, but when our bus broke down at Poptun we thought about the coincidence just a little. Mark and I walked a few blocks down the main street and to our amazement found a place that had Gallo; another coincidence. The bus problem turned out to be only a couple of broken serpentine fan belts. A repair crew showed up in less than an hour and quickly fixed the problem. By 4:00 PM we were back at our boats on the Rio Dulce. They were all safe and unmolested. In the evening, Maria and Norm from the sailboat “Quetzal” invited us to go to Sunday services at the Kek'chi Mayan village, Las Brisas del Golfete. Maria and Norm are missionaries with “Kids to Kids” and work with that village. So at 8:00 AM we all loaded into their boat for the trip down river. Now this was really something. The huts, as always, were made up from vertical cane sticks tied together with string and having palm frond thatched roofs. We were greeted by Justo (pronounced Husto), the village President. He was elected by popular vote, for life if he so chose. The village had about 3 or 4 hundred people. It was neat and well kept. We visited the Sunday church service, but there were few in attendance because Saturday night had been a scheduled quarterly Mayan celebration. The community tradition had lasted into the wee hours of the morning so many of the villagers were sleeping in. President Justo invited us into his home to meet his wife and family. Inside were a dirt floor, hammocks, and a few cooking utensils. A single oil lamp made from a small bottle and a wick provided for their evening light. Everyone was well dressed and all smiles. There was a meeting house, an infirmary, the old stick schoolhouse and a new schoolhouse under construction. The new school was nearly complete and had concrete flooring. The children were beautiful, happy and very well behaved. We were constantly surrounded by them. The wanted to talk to us, tell us their names and see the video camera work. We got hugs from a number of them. And although we were told that there were a few folks who were pretty standoffish, most of the villagers were truly happy to see us. We had been made to feel very welcome and were humbled by the experience. Maria, who doubles as a midwife on occasion, told us that the Mayan women's skirts are their symbols of womanhood. They never take them off. Childbirth is accomplished by having the husband put a rope around the woman's chest to hold her upright. The mid-wife must do her work under the dark, heavy skirt. Maria said you need a miner's lamp to do the job. The women easily keep the skirts clean as they are often in the water doing their washing.